He is survived by his loving wife of 67 years, Patricia; 2 children, Karen (Roger) Butterfield of Portage and Kevin (Patricia) Goin of North Judson; 4 grandchildren, Roger (Tiffany) Butterfield of Portage, Nichole (Kevin) Reynolds of Zionsville, Christina (Michael) Davis of Griffith and Dawn (Kirk) Harbart of Portage; 9 great grandchildren, Dylan and Addison Butterfield of Portage, Arleen and Elaina Reynolds of Zionsville, Lucca and Remi Davis of Griffith and Clara, Gabriel and Lillian Harbart of Portage. Alton was preceded in death by his parents, and 3 siblings, Robert Goin, Shirley Mayers, and Carole Plowman. In lieu of flowers, memorial contributions may be made to the Portage Community Historical Society. 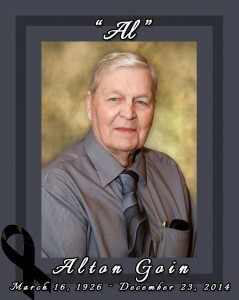 A funeral service for Alton will be Monday, December 29, 2014 at 11:00 a.m. at Rees Funeral Home, Olson Chapel, 5341 Central Ave., Portage with Rev. Dennis Ticen officiating. Burial will follow at McCool Cemetery. Visitation will be Sunday, December 28, 2014 from 2:00-8:00 p.m. with a 7:00 p.m. American Legion Service at Rees Funeral Home, Olson Chapel, (219) 762-3013 or go www.reesfuneralhomes.com to extend condolences.